Seriously, Why Doesn't Anyone In Fire Emblem: Awakening Have Feet? "There's an elephant in the room." It's a phrase people use when there's some super-obvious thing that everyone's consciously avoiding talking about, like, you're at a party where the host just died of a heart attack and was carted off by the coroner, but you're eating teeny-weenies and talking about the weather, and the elephant in the room is that the host just died. The new 3DS strategy game Fire Emblem: Awakening has just such an elephant. Namely, that no one in the game appears to have any feet. I'm not the first one to notice this particular elephant, of course. (Actually, their legs connect straight to the ground kind of like elephant feet do. Coincidence? I THINK PROBABLY.) I've seen the question asked on message boards all over the place, and Stephen mentioned it twice in his review. I've yet to see anything resembling a concrete answer for why this is the case. (That's not to say one doesn't exist.) Why does no one in this game have feet? Their ankles connect straight to the ground. It looks painful and ungainly, though they do move quite gracefully. In drawings of the characters, they have feet. Past games in the series appear to have featured feet. So I'm turning to you, fine Kotaku readers. Is there some official reason for this that I'm unable to find? Do you have any theories of your own? Are these people part-horse? Maybe the feet will be DLC? 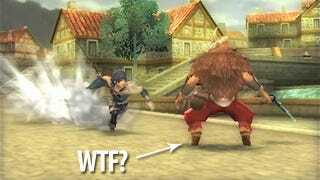 I ask you: why doesn't anyone in Fire Emblem: Awakening have feet?